Could Cannabis Hold The Answer To Alzheimer's Disease? Understanding the brain is never an easy thing - especially when it is stricken with Alzheimer’s. There is now evidence to suggest that cannabis could help, so we take a deeper look at it all. Alzheimer’s is a debilitating disease that society is still struggling to understand and treat. It adversely affects the lives of everyone involved, from the patient themselves, to their loved ones and family that surround them. Research is striving to find new and novel ways to shed light on this illness, and one current focus on cannabis. So we are going to take a look at the situation. Alzheimer’s disease was first recorded back in 1907 by Dr Alois Alzheimer. It was initially observed in a middle-aged female patient named Auguste Deter who showed signs of dementia and other specific changes in her brain. Because she was middle aged, instead of being in her twilight years, Alzheimer’s was considered a rare occurrence, only seen in those under the age of sixty-five. It wasn't until Dr Robert Katzman controversially declared in 1970 that senile dementia and Alzheimer’s were the same condition, and were certainly not a normal part of the aging process, that we have come to have the contemporary understanding of the disease that we share today. WHAT EXACTLY IS ALZHEIMER’S DISEASE? Alzheimer’s is a term used for a range of degenerative brain disorders, and is the most common form of dementia - affecting 70% of dementia sufferers around the globe. The disease itself is a neurological condition that causes the death of brain cells, memory loss, and cognitive decline - which begins mildly and progressively gets worse. The sporadic form of the disease can affect any adult but usually occurs in those over the age of sixty-five. The familial form is very rare and is a genetic disorder affecting several genes. Mutations in these genes mean that the person will eventually develop Alzheimers in their forties or fifties. Vagueness in every day conversation and taking longer to do routine tasks. Loss of enthusiasm for what were once enjoyable activities. Frequently persistent memory difficulties especially of recent events. Forgetting well-known places, people and faces. Emotional unpredictability and deterioration of social skills. Difficulty or inability to process instructions and questions. These can signal one or more similar conditions such as Alzheimer’s Disease, Vascular Dementia or Lew body disease. Before we even get to cannabis, and how Alzheimer’s affects the brain, it is important to understand how a healthy brain functions (in some very basic terms). The brain is a multi-system organic supercomputer fed by a strictly regulated network of arteries, veins, and capillaries. There are more connections between neurons (or brain cells) than there are stars in our galaxy. The outer areas of the brain that we all know contain the higher functions, such as creative thought, empathy, morality, and regret. To the sides are where speech is processed and in the back is where the signals from the eyes are processed to give us sight. Deep inside brain, on top of the spinal cord, sits a small area that controls automatic and primitive functions are controlled like breathing and the beating of the heart. Here is where muscle memory is located, allowing us to ride a bike and hold a knife without relearning them every time. Deeper still are the hippocampus and limbic system, where new memories are processed and sent out into the rest of the brain and where neurogenesis occurs, the creation of new brain cells. The way the brain actually functions is through the communication between neurons. The complex array of neurons that make up the brain talk to each other all the time and this chatter is made possible by neurotransmitters. These chemicals are released by one brain cell, move across the synapse, and are received by another brain cell. This whole process is repeated, and another torrent is released - millions of times per second. This constitutes thoughts, reflexes, and how our bodies transmit senses from the spinal cord to be decoded into experience. Neurotransmitters are a delicately balanced chemical cocktail that lets the brain communicate with itself the body and the outside world. The brain has over 100 billion brain cells and 10-15,000 connections per brain cell require the smooth operation of neurotransmitters to function. 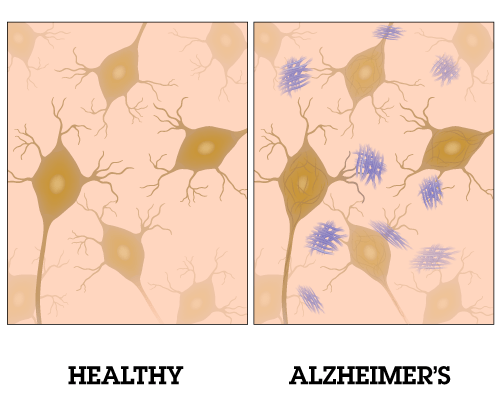 Now that we have looked at how the brain should be, it is time to take a look at what Alzheimer’s does. The reason we detailed the so much about the brain is for this one simple reason: the whole brain is affected by Alzheimer’s disease. Back in 1907, the good Doctor Alzheimer discovered post-mortem in Mrs Deter that the outer layer of the brain cortex - the part of the brain responsible for memory, language and judgment - had shrunk remarkably, and that the shrinkage was caused by the death of brain cells. He also discovered neurofibrillary tangles within the cells and other known plaques on the outside of the cells. The aggressive protein APP/PS1 beta amyloid builds up microscopic plaques in between brain cells and interrupts the smooth exchange of neurotransmitters. Tau proteins build up within the cell itself causing the neurofibrillary tangles that inhibit food and energy from circulating the brain, causin cells to die. Neurogenesis within the Hippocampus is also affected by Alzheimer’s, so not only are brain cells and their connections being attacked, but new brain cells are not being created. Scientists are not yet sure, but there could be another underlying process to the disease that directs these aggressive proteins. Degenerative brain disorders like Alzheimer’s inhibit the normal functioning of the brain, so maintaining healthy brain tissue throughout life is important and can reduce the risk of Alzheimer’s Disease - as well as other disorders of the brain including MS and Parkinson’s. This is most effectively achieved by regular physical and mental exercise, but research is showing that the balance of chemicals in the brain can be enhanced by the introduction of cannabinoids that are hostile towards Alzheimer’s Disease precursors – a certain set of enzymes. The presence of these enzymes are the early indicators and hallmark characteristics in Alzheimer’s Disease diagnosis and are a major contributor to the progression of the disease. Stimulation of endocannabinoid system with chronic doses of the THC and CBD in mice was shown to promote elasticity of existing cells, prevent neural inflammation and bolster neurogenesis. They acted as antagonists toward the particular enzyme that allows aggressive peptides to accumulate in brain cells, and helped to prevent plaques and neurofibrillary tangles forming. Experimental evidence has been shown that when CBD and THC are administered protectively to AD mice, it can relieve symptoms of social withdrawal, improve facial recognition, and improve memory. There is no known cure for Alzheimer’s, and drugs are usually only prescribed for secondary symptoms, such as restlessness or depression. Cannabinoids have been shown to alleviate agitation in aggressive patients and nocturnal disturbances in agitated patients. They have also been shown to calm the disturbed, imbue sleep, stimulate appetite and fight depression in the Alzheimers Disease sufferer. There is still much to learn about the complexities of the brain, about Alzheimer’s, and about the medicinal effects of cannabis. But the development of a treatment that slows or halts this disease’s progression is imperative to enhance the quality of life for patients, and alleviate health care costs associated with Alzheimer’s Disease. There is much evidence that indicates that cannabinoids have an important role to play in neural health, but much more research is needed to gain a definitive insight – hopefully leading to clinical trial. Until then, things are still uncertain, but one thing is for sure: results so far are overwhelmingly positive. There could be a bright future for cannabis-derived medicine ahead.